This is an educational art trail devised by teachers and students from IPS Ravizza, Novara, as part of the Erasmus+ project GEOCACHING MINDS ON THE MOVE. Then download the attached pdf file (better print it before visiting the place), read it and observe what you see around you. You will be asked to complete texts, answering quizzes and take photos. At the end of your tour download the word file, complete it according to the directions and bring it to school to your teacher. 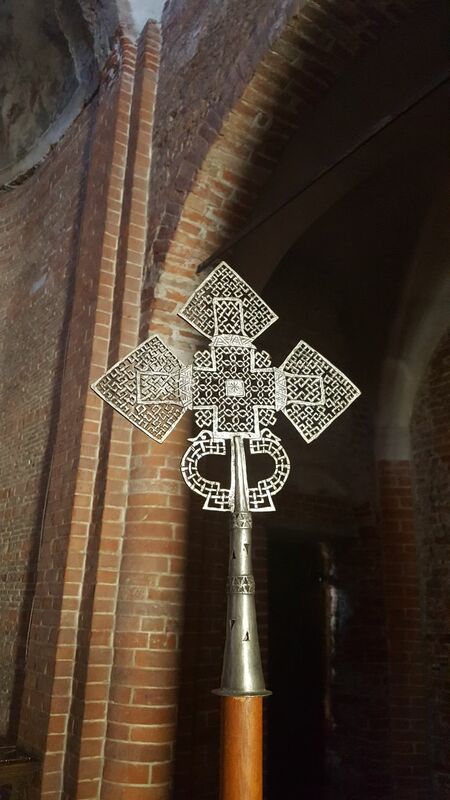 Now get inside the church and see if you can find all the elements/parts marked in the pictures above. Note that the plan and drawing in this page do NOT correspond to the All Saints’ Church but they are just a tool to help you learn new vocabulary. 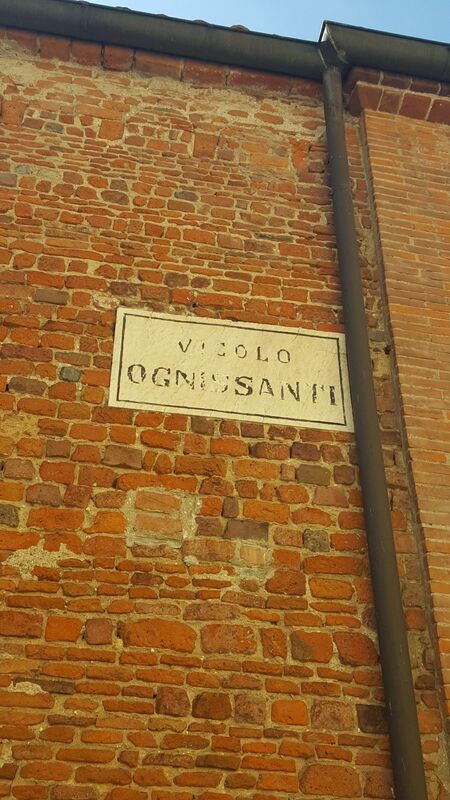 According to the beliefs of the time, the Church of Ognissanti is oriented towards Jerusalem, the holy city. The building has …………………1. 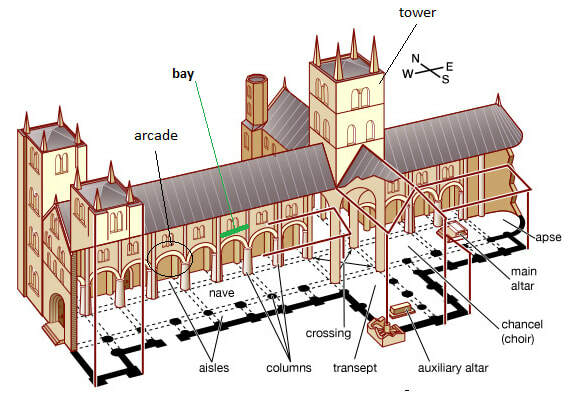 side aisles and a central nave, with masonry covering and has a non-protruding ……..…….2. 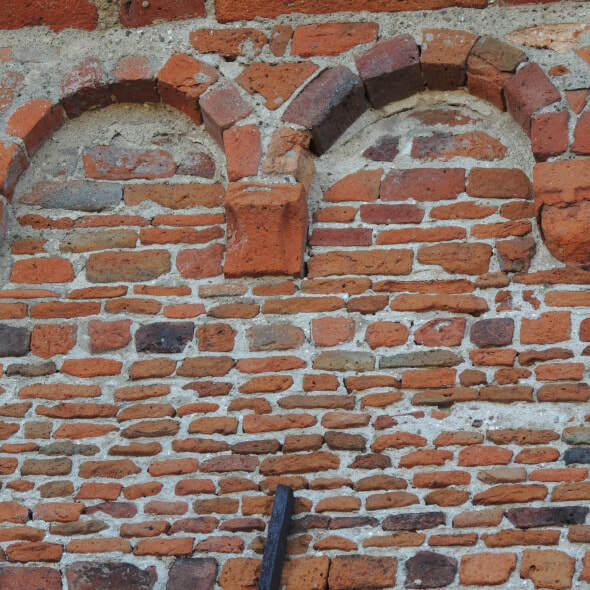 The masonry is made up of new bricks, but it also includes materials recovered from demolitions, square stone blocks and river ………….……….3. Having a careful look at the walls you can clearly understand which parts are the oldest (and original) and which have been replaced in the second half of the eighteenth century and/or during the church restoration of 1953-1960. The church has three …………………4. : in addition to the central one, another one can be found in the …………………5. aisle and a third in the …………………6. 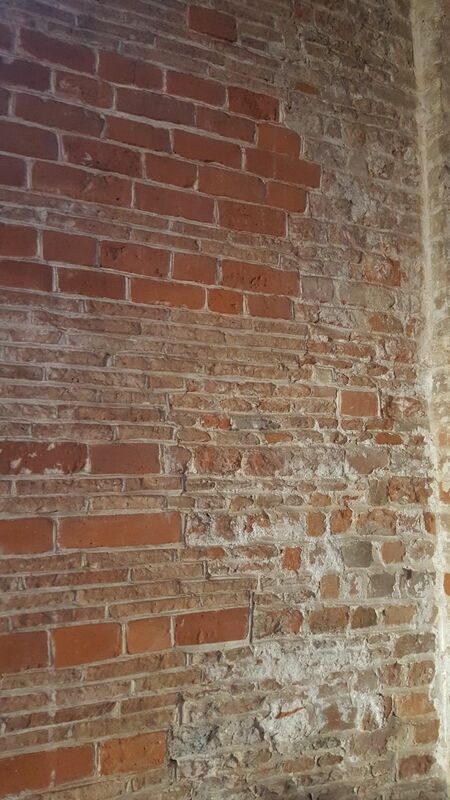 part of the transept, which formerly brought to the parish house. The windows are …………………7. 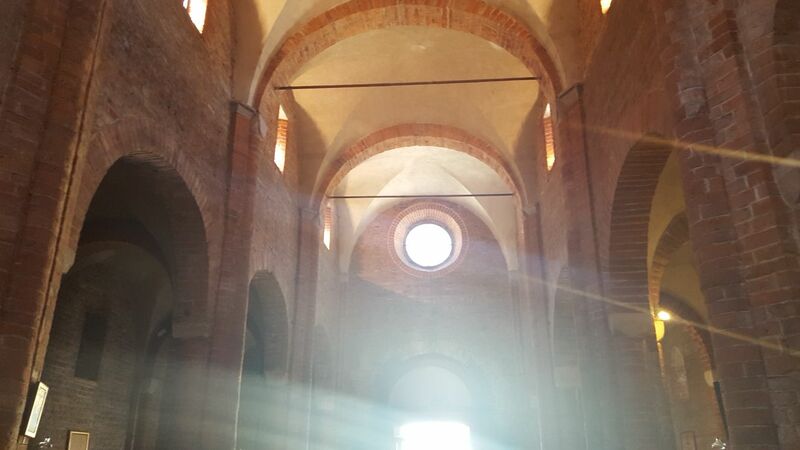 -arched and open almost regularly to the center of each bay of the side aisles, the transept, and the apse. The …………………8. cover is supported by …………………9. 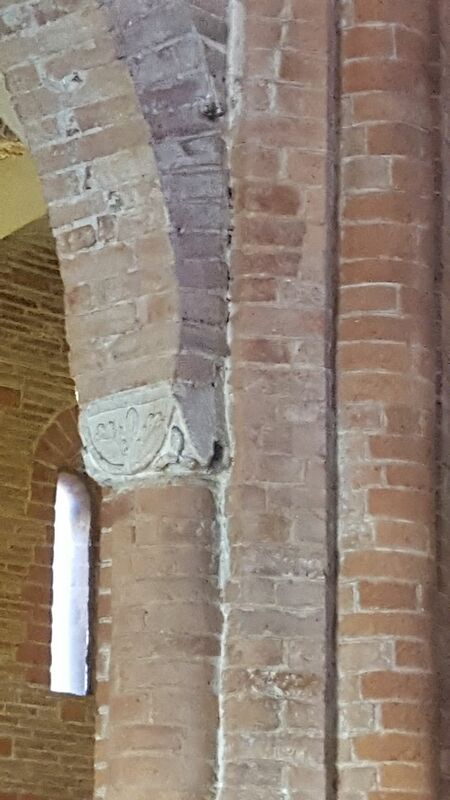 polystyle major pillars, four of which are attached to the perimeter walls, in which there may be a reference to the twelve apostles supporting the whole Church. All pillars, even those on the perimeter walls, have …………………10. bases. These are irregular and external to the flooring. The floor is the result of the restoration of the late 1950s. 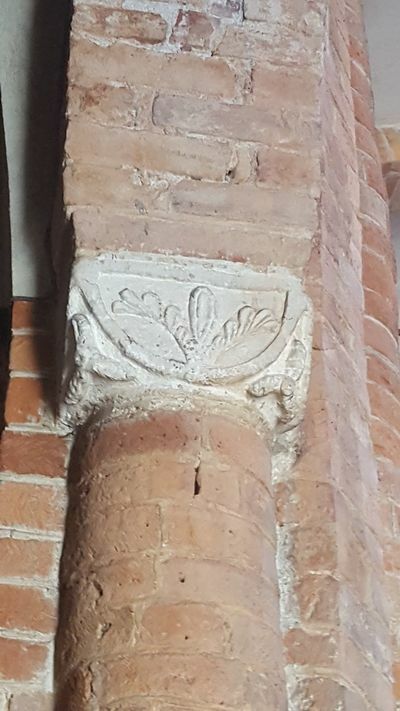 stylized acanthus leaves others embossed curls and "tau" bands, or three-petals flowers at the corners, or geometric designs, or relief figures. 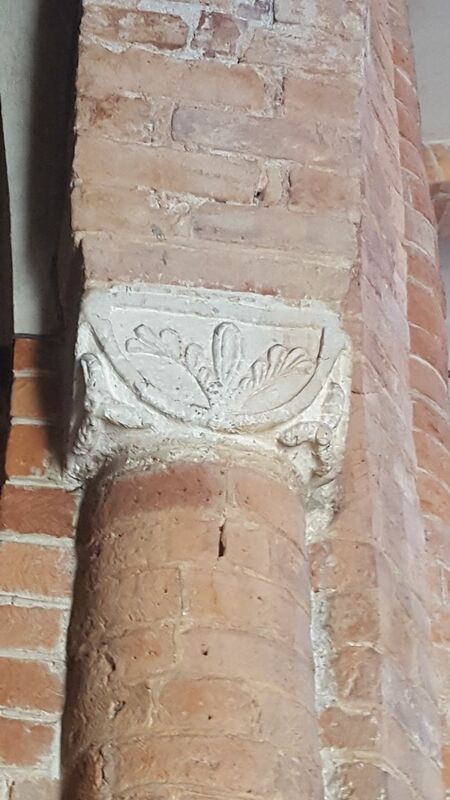 Most of the capitals are original, and were not touched during the restoration works of the 17th and 18th centuries; others, have been replaced during the restoration of the 1950s. The semi-circle central apse has a very pronounced ………………12. 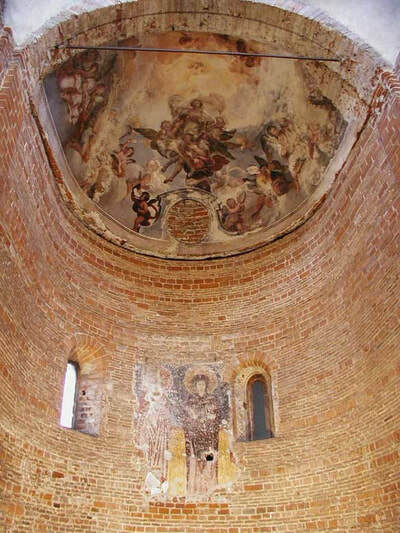 The apse cover is semi-spherical. 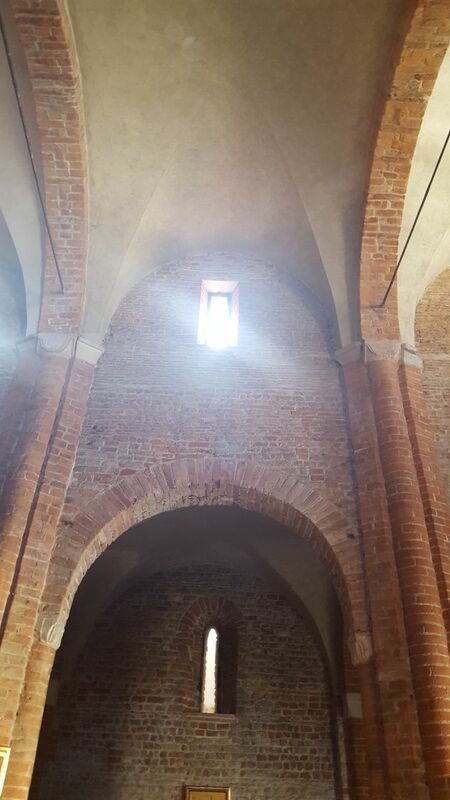 Two single-arched windows open in the apse. From the middle of the transept look upwards and notice an octagonal lantern, which originally hosted the bell tower. The …………………13. 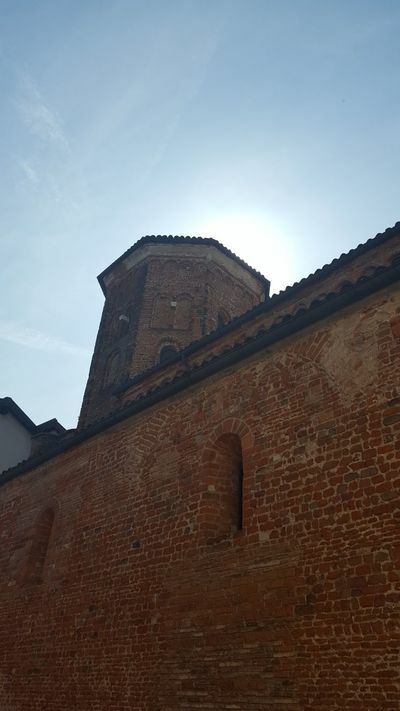 is a recurring motif in other early Romanesque religious buildings in Novara, such as the baptistery, which is of great importance in the religious life of the time, or also the Cathedral of Santa Maria, almost contemporary with the construction of Ognissanti. The eight sides indicate the number seven, a symbol of perfection, enriched with a unit, that of the eighth day, the Lord's day, the day of Resurrection. The …………………14., is modern and during the restoration works was placed on top of the ancient one. 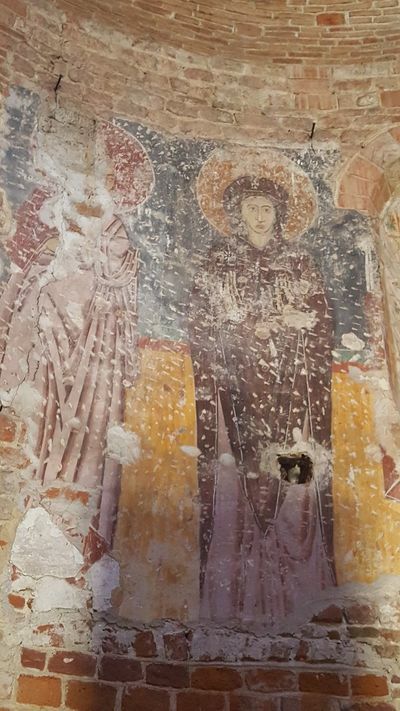 The apse, frescoed in the second half of the twelfth century, shows a Madonna with the 12 apostles – the fresco is quite damaged so actually we can only see one of them! The background of the fresco is light orange in the lower part, …………………15. in the higher part. The Madonna is standing at the centre of the scene, she keeps her hands near her …………………16. with her palms oriented to the devotees, in prayer, according to the Byzantine style. She wears a long …………………17. dress and has her head covered with a dark red cloak and veil that come down to wrap the top of her figure. The mantle is decorated with …………………18., representing her intact virginity. 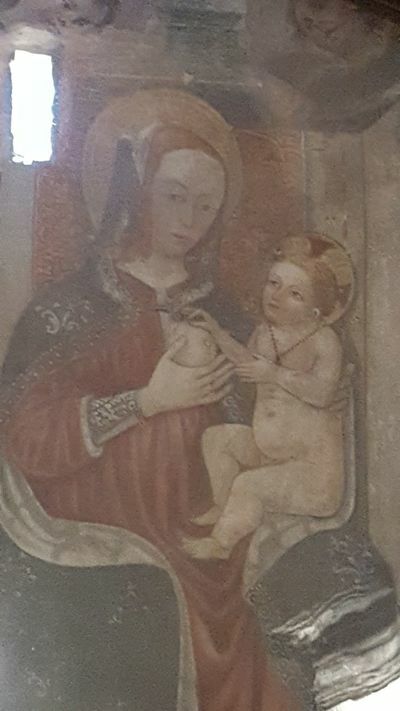 Towards the end of the fifteenth century, the church was enriched with some frescoed altars: the only one remaining is a Madonna on the throne that nurses her Child Jesus, called the Madonna of Peace or Consolation. Frescoes with the same subject were common at that time: they were dedicated to Mary protecting all mothers who brest-feeded their babies. The façade, which was the result of the restoration of the 1950s, has a broken pediment and a large …………………19.. The small existing churchyard was created in the eighteenth century with the demolition of a narthex. 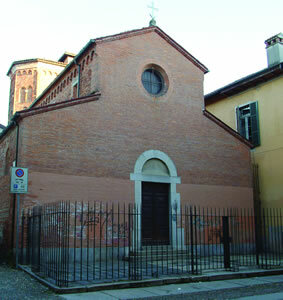 The narthex was then closed and embedded in the church in the sixteenth century. Does the narthex still exist? 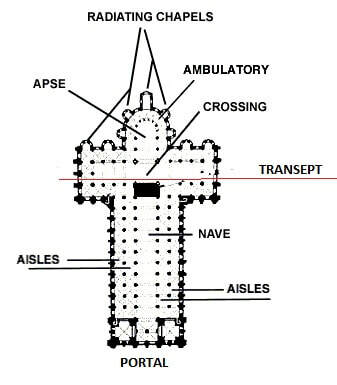 The bell tower rests on the perimeter walls of the church and fits exactly above the vault of the transept arch. It is hardly visible. 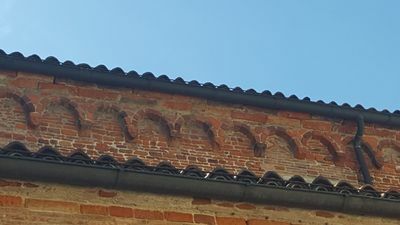 The outer walls are smooth and crowned by a continuous frame of hanging arches. 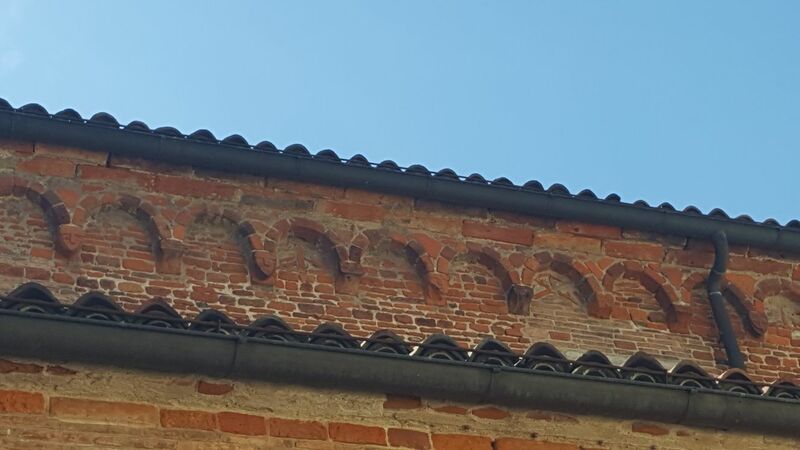 Some bricks are decorated. Under the roof of the lantern runs another set of arches. On each side we can see a large single-arched window under a double-arched one. 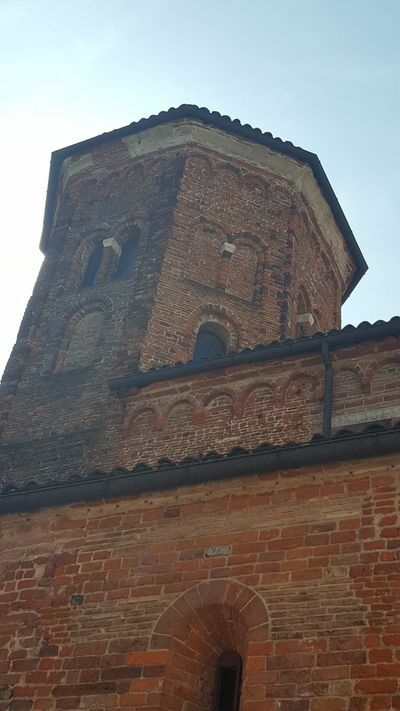 Of the fifteen outer windows of the bell tower, only eight are open. If you haven’t found the CACHE before you can try this side of the church. You might be luckier!